Aravinda Premadasa races another year as Havoline Brand Ambassador | Welcome to Chevron Lubricant Lanka PLC. 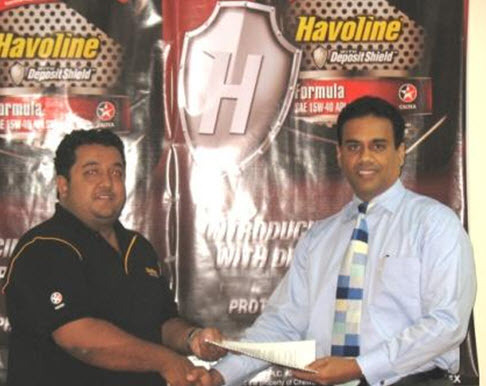 Chevron Lubricants Lanka PLC has announced the contract extension with renowned Motor Car racing champion Aravinda Premadasa as Brand Ambassador for Caltex Havoline. Aravinda has been associated with Caltex since 1997 being a pioneer member of ‘Team Caltex’ that participated in the Kandy Road Race, the Eliyakanda Hill Climb and the Pannala Gravel Race that year. “Caltex Havoline is a trusted brand with a proven ability to deliver. The brand stands for commitment towards the highest quality and reliability in technology, innovation and excellence in performance. And these very same qualities are epitomized by Aravinda Premadasa, whose experience in racing has made him amongst the top racers in Sri Lanka. We are indeed very proud and privileged to extend our partnership with him as our Brand Ambassador for another consecutive year” said Mr. Kishu Gomes, Managing Director/ CEO of Chevron Lubricants Lanka PLC. Aravinda Premadasa commenced his motor racing career at a very young age, initially winning the Rover Go Kart Championships at the age of 7. Aravinda has since gone on to greater acclaim both locally and internationally. As a student of the Jim Russells Racing School he was awarded the Most Promising Overseas Driver title in 1995. “Racing is a sport where every second counts. Speed, focus and skill alone cannot win a race. As a professional, I depend on my engine to sustain through the race. I put my trust in Havoline, because it protects my engine even during the most extreme temperatures. It is a brand I can depend on for guaranteed performance and I am happy to endorse what I believe in” says racing car expert Aravinda, son of veteran race champion Suranjith Premadasa one of the most renowned individuals within the Sri Lankan racing circuit. With over 20 years experience in the field of motor racing both in Sri Lanka and overseas, Aravinda has accumulated innumerable wins in gravel, tarmac, circuit and hill climb events. The 2008 Foxhill Super cross, Radella Hill climb, Magastota Hill Climb and the Tissamaharama Track event were the most recent wins for Aravinda. He has also retained the Gajaba Supercross Championship trophy for 5 consecutive years (2001-2005), and won the prestigious SLARDAR Championship for 3 consecutive years (2003-2005). He has also been recognised as the only competitor to win the Super Fox, Gajaba Trophy and the SLARDAR Championship consecutively on more than one occasion. He was the winner of the President’s Trophy 2006 at the Tissa Auto Drome.